By: Anthony E. Davis, Esq. Cool Nutz a.k.a. Terrence Scott is a Portlander through and through. He grew up in inner Northeast. He went to Beaumont Middle School and Grant High School, before both of those schools were filled with rich white kids. At Beaumont he was a b-boy, along with Bosco, Jumbo and Versatyle from the Lifesavas. When breakin' began to fade, he and Bosco started MCing and DJing. He graduated from Grant in 1990. He was in Northeast during the simple times. A time of community. A black community. Riding bikes around the hood and playing ball at Irving Park. But he was also there when the gangs came. Both aspects of the hood influenced him. He has a love of the hood, and he has a respect for the hood, and he has an understanding of the gang life that took hold in the late 80's. That life touched him directly when his younger brother was killed in a gang related shooting back in 1990. The street life, good and bad, influenced him, and it influenced his music. Although people from Cali and New York probably don't see Portland as a hotbed of gang activity, in the mid-80's to early 90's the Bloods and Crips were eating up large parts of North and Northeast Portland. Terrence was there, he saw the drama, he lived the drama, and the hood remains in his music, music which he refers to as "Hood Hip Hop." Although he liked the early 80's battle rhyming braggadocio rap that fueled the breakin' scene, he vividly recalls the first time he heard Run D.M.C's "Rock Box." It was first time he heard rap that was hard. Rap that had edge. L.L. Cool J, Just Ice and Rakim. He still likes this music, but he likes a lot of different rap styles. When asked who his biggest influence was he couldn't say just one. Instead he listed Chuck D, Ice Cube, MCA, E40, Jay-Z, Rakim, and Tre Deep. When asked his current favorite cd -- he says the most thorough album out right now is Jay-Z's "Blueprint of Hip Hop." What impresses him most about the album is that its Jay Z's sixth album and it is still new and fresh. When I asked who he thought the most overrated rapper was, like a veteran of the game, he said he didn't think anyone was particularly overrated, there are just some people who he didn't personally like. But he never said who. I even threw him a couple of softballs: M.C. Hammer and Vanilla Ice. But he said that Hammer was one of the best performers that he'd ever seem. More importantly, and more perceptively, he said that artists like M.C. Hammer and Vanilla Ice brought a lot of people to hip hop. After Hammer and Vanilla Ice faded out, those fans went looking for more hip hop. Cool Nutz sees the big picture. He's in it for hip hop. He's in it for Portland. He's in it for Jus Family. And he's in it for Cool Nutz. When the conversation turned to the Portland hip hop scene, it got more serious. He explained the pressure of being often called rap impresario of Portland. 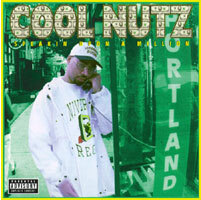 For years people have been counting on Cool Nutz to bring Portland to the national hip hop scene. He's been on the verge a few times, having signed two different major record deals. For whatever reason, both deals fell through. But even after two failed record deals, he still believes in himself, in his label, in the Portland hip hop scene. He thinks it will happen with his upcoming cd "I Hate Cool Nutz". When asked if any of the other local artists are on the verge of breaking through, he names Lifesavas and Bleq (a solo artist on the Jus Family label, who's natural ability he compares to the likes of Snoop Dogg). He also names Boom Bat Project, Old Dominion and Mr. D.O.G. from Seattle. But its not going to be easy. One of the many obstacles local acts face is the fact that local radio doesn't play local artists. Its hard to go national, when you can't even get your music played on the local radio stattions. In our two hour interview, one of my first meetings with Cool Nutz, he consistently surprised me with his insight and business acumen. I'm sure he surprises a lot of people for a lot of reasons. When asked if he had anything to say to our readers he simply said: "Support the local hip hop scene. Come to the shows. Buy the records." Terrence is a man who is thankful for what hip hop has given him, but he's worked for over a decade, and he wants more. Lets hope for Portland's sake he gets it. Lord knows he deserves it.